Judged Classes closed 11th September Treffin remains open until 18th Sept.
Porsche Centre Sydney South will be displaying a broad spectrum of new Porsche's, there are a number of trade displays promoting Porsche related car care and restoration products to help members care for or enhance their Porsche investments. Club merchandise will also be on sale from their own Marquee, presenting the perfect opportunity to buy the clubs apparel. A Hospitality Marquee is provided for you to relax, enjoy the refreshments on sale, or simply watch the Porsche related entertainment on offer. Fagan Park Acadia Rd Galston, has been chosen because it offers a lush green landscape to show off your car, enjoy the day of camaraderie, picnicking, and a gentle stroll throughout the different themed gardens. At the conclusion of the days judging certificates we will awarded, there will be a mini awards ceremony for all category class winners as well as the perpetual trophy winners which will be captured on film. 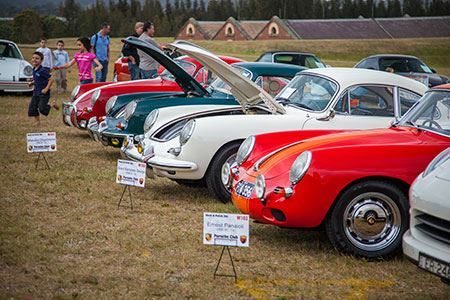 In addition to the Concours trophies Porsche Ag have provided PCNSW with a number of specially minted trophies to celebrate the 40th Anniversary of Porsche Transaxle Cars such as the 924, 944, 968 and 928. These trophies are to be presented to best 924, 944, 968 and 928 cars entered in either Concours or the Wash & Polish categories. Therefore, all members with transaxle cars are encouraged to prepare and enter your cars in Concours or Wash & Polish to be eligible for one of these 40th Anniversary Trophies. This year PCNSW has achieved a milestone of 1000 plus members, so my personal goal is more than 200 of the clubs cars from all facets of the club to gather in one place and share all this event has to offer. If you haven't already registered I encourage you to do so as soon as possible as there is only about 2 weeks remaining before we close off bookings for Judged Categories.